On January 26, 2013, the maiden voyage ceremony for mainland China’s first luxury cruise ship "Henna" was held at Sanya Phoenix Island International Port, with the theme of "Movement of the Sea, Sailing of the Heart". Leaders of the China National Tourism Administration, Hainan Tourism Bureau, HNA Group, HNA Tourism Co., Ltd and its Cruise Yacht Management Co., Ltd. attended the maiden voyage ceremony and inauguration for Henna. Ms. Xu Ying , 2009 Miss Asia champion, smashed bottles for the maiden voyage as the "Sailing Goddess" of Henna. The first voyage of Henna marks the Chinese brand’s official entering into the cruise tourism market, breaking the monopoly of foreign cruise companies in the Chinese market and providing Chinese tourists with a brand-new choice among cruise tourism products. 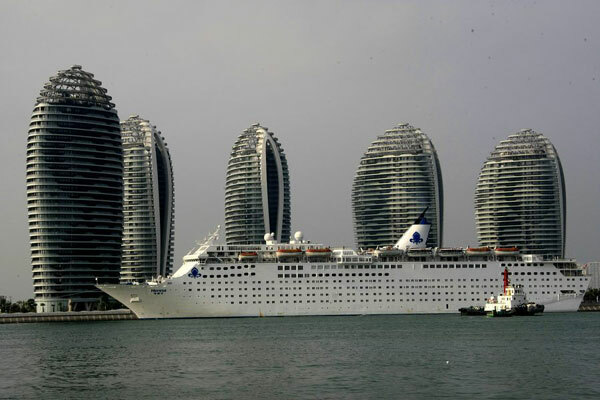 Currently, Henna is the first and largest luxury cruise liner in mainland China, with 739 passenger cabins and a maximum passenger capacity of 1,965, including nine suites with balconies, 432 ocean-view staterooms and 298 interior staterooms. Henna comes fully loaded with an unlimited supply of fun onboard entertainment: restaurant, duty-free shop, casino, cinema, spa center, banquet hall, bar, multifunctional meeting room, chess room, child care center, gym and swimming pool, etc., all to bring passengers a perfect experience of leisure, entertainment and sightseeing. With Spring Festival close at a hand, a cruise aboard Henna offers an escape from the large crowds of peak tourist season, with tropical sea breezes, exotic beauty and a festival experience for only the price of accommodation in Sanya. From January to April, Henna will run along three routes: Sanya – Halong Bay, Sanya – Da Nang, Sanya – Halong Bay – Da Nang. From May to September, its homeport will be shifted to Tianjin, with a new route launching between Tianjin, Incheon and Jeju Island. A variety of cruise packages and one-stop services will be provided, including single-tickets, individual packages, group packages and customized products. For tickets and more information, please call +86-95071888 or visit the official website at www.hnacruises.com. "Henna" cruise is managed and operated by Cruise Yacht Management Co., Ltd., owned by HNA Tourism Co., Ltd. As one of the five industry groups of HNA Group, HNA Tourism has always held the development strategy of innovating business models, building a service network of the tourism industrial chain and making a new economy of modern tourism over the years. HNA Tourism has become a modern large-scale tourism group covering five fields of aviation, tourism, tourism finance, hotels, IT and Internet. It is among the Top 20 Chinese Tourism Groups and ranked sixth during its four-year development period.